Recipe by Sarah Pflugradt of Salubrious RD. In a medium sized mixing bowl, cream together the butter and sugar, either by hand or with a hand mixer. On top of the mixture, add flour, baking powder, salt, and cinnamon. Stir or mix until just combined. Stir in milk. 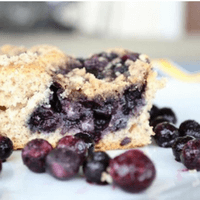 Top with frozen blueberries in an even layer. In a small bowl, mix ¼ cup flour, butter, brown sugar and cinnamon until crumbly. Sprinkle crumble topping on the blueberries. Bake in a preheated oven for 40-45 minutes or until a toothpick inserted into the center comes out clean.